On this day in 1951 is the one and only time that Hazel ever mentions quiltmaking in her diary. She was a quilter, and made several quilts, and had several started at the time of her passing; but she evidently did not do much quilting during high school. During our very first Quilt-Along here on The Life of Hazel Ilene, I offered up a bonus block that participants could use in place of any of the other blocks, in case there was one they didn’t like and needed to substitute. I chose the traditional block “Royal Star” for our bonus block. Since I’ve removed most of the instructions for that first Quilt-Along from the blog, the link to this bonus block has long been lost, but in honor of Hazel’s one and only mention of quilting in her diary, and the fact that it was “star quilt blocks” she was making, I’m posting an updated link to this free pattern today. 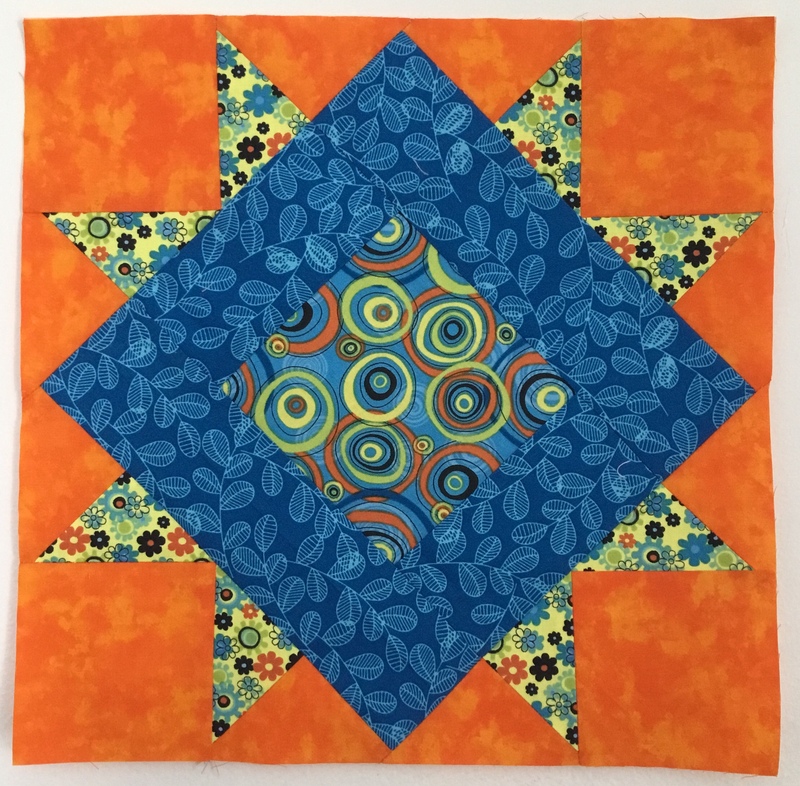 You can find it HERE: Royal Star Quilt Block. Wouldn’t this be cute with a fussy cut center square? There’s a lot you can do with this one! I think it would be wonderful to make an entire scrappy quilt out of these. And I need to shut up now before I talk myself into a new UFO! Happy stitching! Judy came out & stayed all day today We really had fun. She taught me to make earrings out of ricrack. I remodeled my bathing suit. (its real cute now) & we went to the pond & Buck sprayed water all over us. Really fun. Apparently, her swimsuit wasn’t cute enough the way it came from the store, so she “remodeled” it. I can’t say I haven’t done the same thing with some of the items I’ve purchased over time. Have you ever brought home a garment, and then proceeded to “remodel it” for yourself? Introducing the alternate project for Block 3 . . . the Wildflowers Table Runner! 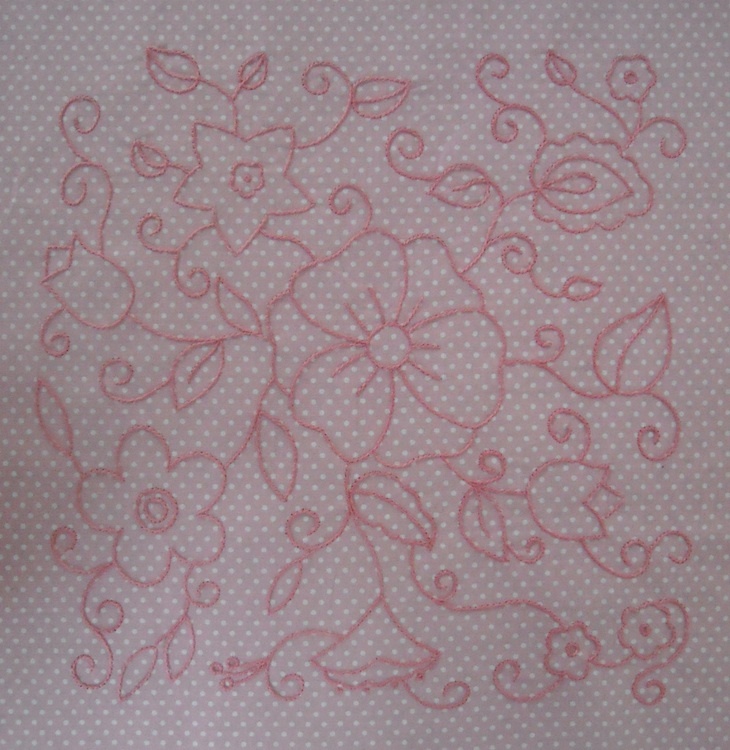 For this project, I used Block 3 for my center embroidered block (but you could use any one of them you prefer). Furthermore, I did my embroidery on a print fabric. I chose a floss color that would show up, yet still give it a soft, subtle look. And then I turned that block into a table runner. I think I need to go back and add some more quilting to the middle of it, but no sense in making all of you wait any longer. I can do that any time. 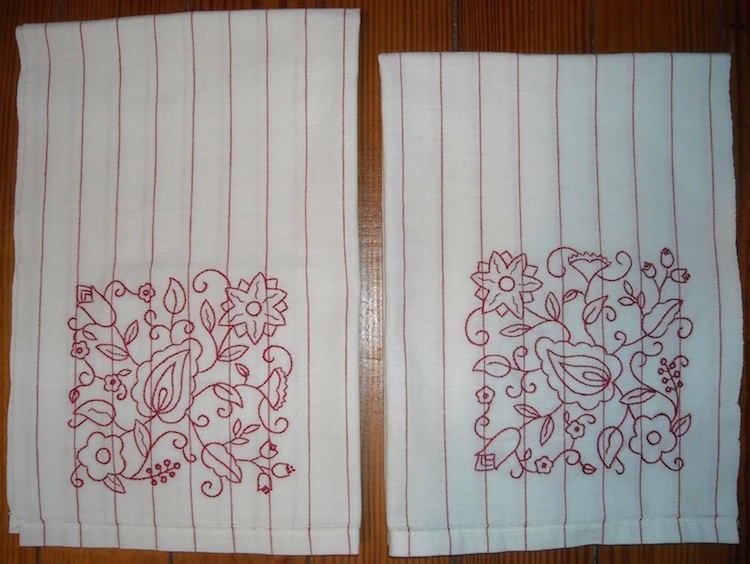 You can download the PDF file with all the instructions here: Wildflowers Table Runner. You can find Block 3 HERE. I’ll be back next week with Block 4. I know you’re all waiting anxiously for it. And I have to tell you, the only reason this has all taken me so long is that when we moved, I didn’t pack everything myself, and after moving twice, I lost all the pieces and parts of these projects! It took me a long time to find them, since we still haven’t really unpacked too much stuff since getting here. Hopefully, I’ve finally gotten my act together enough to continue on, and I won’t be so delinquent in the future. Thank you all for your patience with me, and stay tuned for Block 4! 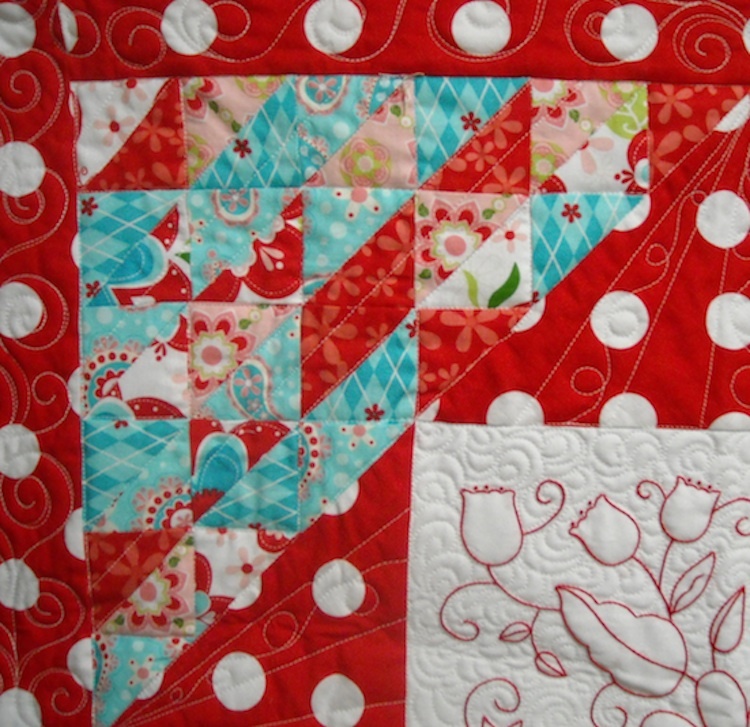 This wall quilt uses the plain version of Block 1, surrounded by patchwork. It measures 30″ square when finished. 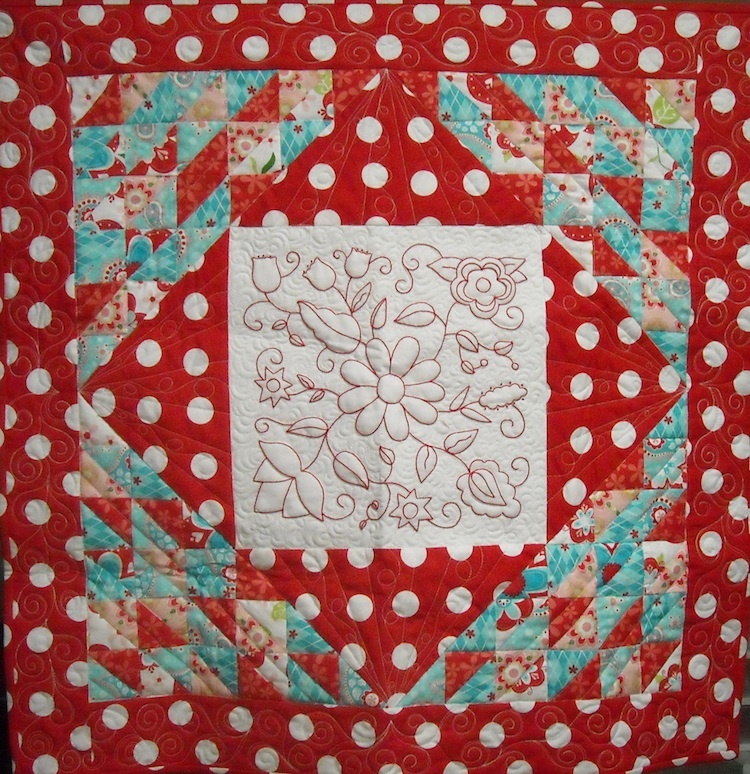 You can see that I simply used scraps from my large quilt to make my wall quilt, so I matched my embroidery thread to the fabric once again, and did it all in red. I think it would be great done in other color schemes. I can’t wait to see what you all do with it. Please send me pictures! 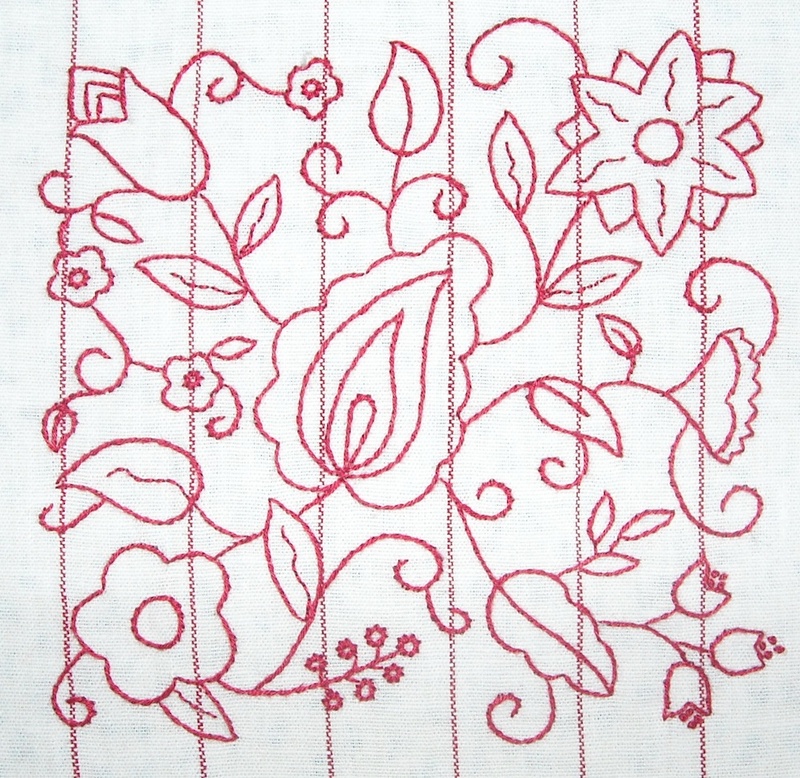 For the pattern, you’ll need to download the Block 1 pattern file, which can be found HERE. 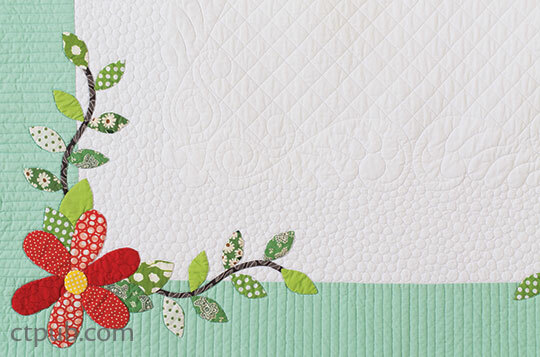 For the wall quilt instructions, click HERE to download the PDF file. I’m planning to post Block 2 on September 1, so check back!